I think this table (below) was made by the same company. Same chassis and same speaker grill. 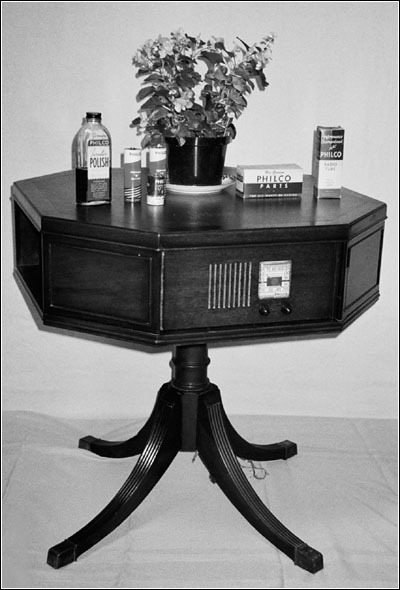 I have almost the exact table but it has a Brunswick radio in it. I would think that there should be some screws on the bottom side of the table that, if you unscrewed them, the bottom should disassemble and access to the radio will be possible. Had a table set a few years ago,here are some pics, the top was removable. Just a thought Paul,the table could have been refinished and is glued to the base w/ lacquer or ?? Can you see the underside of the top,through holes on bottom. I wouldn't think the top would unscrew by turning counter clockwise,but you never know. I’m glad it found a good home.